America has always been big on sportswear, but it's become clear that next season's wardrobes will be looking even more athletic than usual, whether exercise is involved or not. 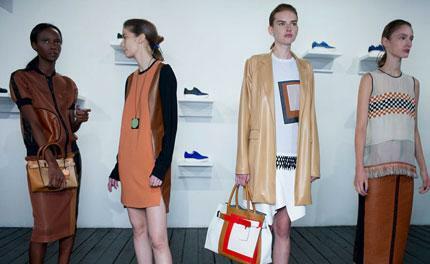 Reed Krakoff has continued to refine his take on sports luxe. At his presentation today, which featured a wall installation of the felt chairs he designed for Established & Sons, Krakoff unveiled a sophisticated collection that mixed textures like perforated leather, macramé, floaty silk chiffon and stiff cotton with wonderful dexterity. Silhouettes were sleek but amped up with the use of graphic details, like bold outlines and strong colour blocking. Zip-up moto jackets and vests were luxurious and grown up, thanks to panels of python and snakeskin. Of course, the accessories were no slouch either. Sporty platform oxfords were refreshing counterpoints to Krakoff's classic handbags, rendered in a fresh colour mix of cobalt blue, white and tan, and made the collection feel both contemporary and cool.